BHFoE had a stall at Seedy Sunday on the 2nd of February. 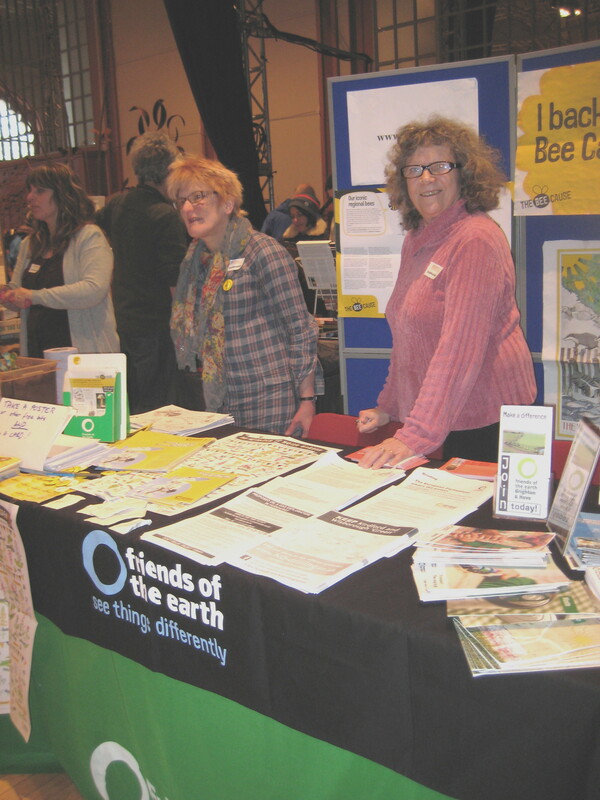 The Brighton Corn Exchange’s hall was packed with exhibitors and visitors, so we attracted much interest for our current campaigns -as much as we had for our stall at the library which we kept going for a few weekdays. We got 59 new cards signed to keep the momentum going for the Bee Cause. 11 cards were signed for councillors to oppose fracking (‘F is a dirty word’ campaign); this is good given that the card is only relevant to people living outside Brighton, as we are already ‘frack-free’. Then we collected 5 letters opposing exploratory drilling for gas/oil in the National Park at Fernhurst. Some people took information away with them, so they may help/object online at home too. Many of our leaflets concerning energy issues went very quickly, as did those concerning bees. So we can call this a success, and make sure we return next year! Thanks to all who helped.